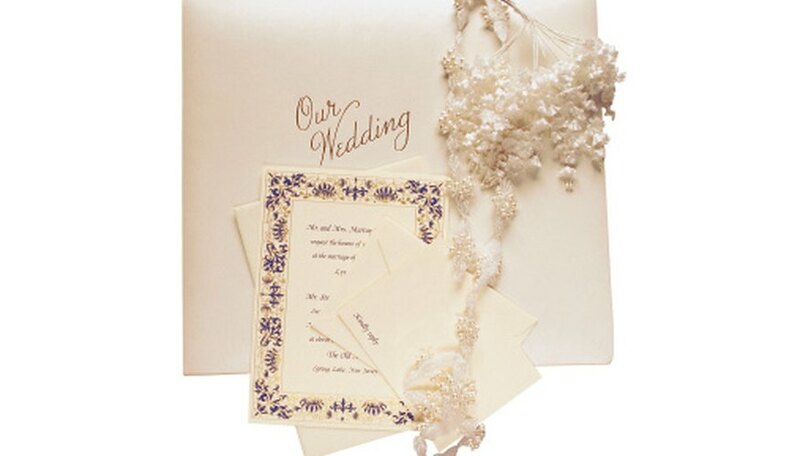 Most wedding invitations include an RSVP, or response card, that invited guests mail back to the couple to say if they will attend the wedding. How you word your RSVP cards depends on the style of wedding you plan on having, how the invitations were worded, and your own taste. A formal wedding requires a formal RSVP card while more casual affairs can use more relaxed language the cards. Some RSVP cards also ask the guests to specify the entrée they'd like. Write the date you'd like the reply by at the top of the RSVP. A casual way to request a reply is to write "Please reply by the 10th of June." A more formal way to request a reply is to state "The favor of your reply is requested by the 10th of June." If you are accepting invitations on a rolling basis and do not have a set date for replying, simply write, "Thank you for your prompt response" on the top of the card. A few lines below the date deadline, write either "Name" or "M" followed by a blank line. Name is less formal, while "M" implies that the guests should fill in Mr., Mrs., or the appropriate salutation. Let the guests tell you if they will attend the wedding by including a line below the name line. Make a small blank line, then write "will attend" for a formal invitation or "accepts" for a more casual one. Write "will not attend" or "declines" next to the acceptance and include a small blank line. The guests will check the line next to the appropriate option. Add a line for the menu selection below the accepts/declines line, if relevant. If you are having a buffet, use this line so that guests can let you know of any dietary restrictions, such as if they are vegetarian or allergic to anything. Close the RSVP card with a casual "We look forward to seeing you!" or "Thank you for celebrating with us!" if you would like. If you worry that guests will attempt to bring more people than you have space for, you can add "___ number of seats have been reserved in your name" to the bottom of the card.